The Answer Pad is an interesting educational platform for teachers. It combines two powerful functionalities: it is both a student response system and a grading solution for your quizzes. 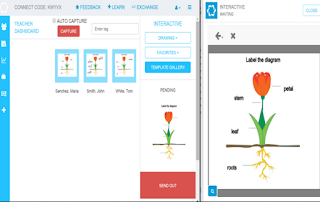 It is an ideal tool for engaging students in a flipped or blended learning classroom. As a teacher, you can use Interactive to directly involve students in their learning by providing them with an outlet through which they can show what they know. Students-generated feedback is a great source of data to inform and guide your teaching and also makes you aware of areas that need more work . The Answer Pad is available for the web, Android and iPad.